With the Indian market becoming competitive, Russian firms target the armoured vehicles sector. The Indian defence industry may be getting more competitive, but Russian military enterprises are brimming with high hopes. At DEFEXPO 2014 in New Delhi last month, Russian military firms showcased their prowess, hoping that Russian armoured vehicles would remain the backbone of India’s tank fleet. India’s inventory in ground forces includes about 600 T-55 tanks, 1,925 T-72M1 vehicles, and 640 T-90S tanks. It also includes 169 Arjun Mk.I tanks designed in India. The fleet is expected to be replenished with another 248 tanks of the next modification – Arjun Mk.II. However, this will not happen until 2025. Until that time, the main strike force will be formed by Soviet and Russian tanks T-72 and T-90. With Russian enterprises focused on these two armoured vehicles at the moment, the developer and manufacturer of armoured vehicles, the Scientific and Production Corporation Uralvagonzavod, offered India several options to buttress its units. The first one entails modernisation of the T-72 tank and involves an increase of the durability of the vehicle and its crew during combat in an urban environment. Designers have equipped the commander’s hatch with a special armoured cab, protecting the commander when firing the machine gun. The vehicle has additional spaced armour modules on the sides and on the turret. There is a system for electronic suppression of guided anti-tank weapons. The vehicle has a 2A46M5 gun and an automatic loader, providing the possibility of firing missiles at a range of 5 km. The gunner’s sight with optical thermal channel can be used day or night in all weather conditions. Thanks to this, the characteristics of the vehicle are level with the best world standards of modern armoured vehicles. In addition, it is proposed to install a 1,000 hp engine to improve the mobility. However, what caught the Indian eye was modified version of the tank support combat vehicle, the BMPT-72. It was nicknamed the “Terminator” in the Russian Army for its firepower. The machine’s design is based on the chassis of decommissioned T-72 tanks. The modernisation operations can be performed, using the kits supplied by Uralvagonzavod. 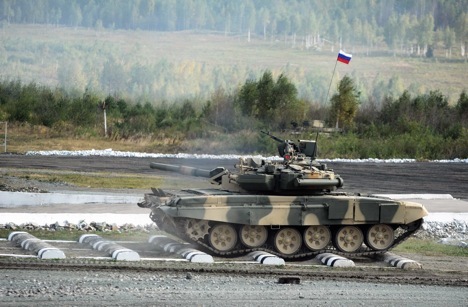 The main advantage of BMPT-72 is that, being created on the platform of the T-72 tank, it provides a unique opportunity to extend the life cycle of vehicles, thus raising the combat capability of the army to a new level quickly, and at a low cost. During the modernisation, a double unit of two 30 mm automatic guns with the battle reserve of 850 shells, two launchers of guided anti-tank Atak missiles with cumulative or thermobaric warheads, the latest 12.7 mm Kord machine gun with a battle reserve of 2,000 cartridges are installed on the T-72 tank. The vehicle is less vulnerable to anti-tank weapons, compared to a tank. The combat capabilities provide the assured destruction of a tank or a permanent firing position of the enemy at a range of up to five thousand metres. BMPT-72 can hit low-flying helicopters, as well as crews of antitank batteries and personnel of the enemy. Military experts say that one BMPT is equivalent to a motorised infantry platoon armed with BMP-3, in terms of combat effectiveness. The designers emphasise that all proposals for the modernisation of armoured vehicles are based on experience of recent military conflicts. The Russian military has already decided to modernise its own fleet of T-72s to the level proposed by Uralvagonzavod.